The incidence of all liver diseases in the developed world has increased significantly over the past decades. These diseases have chronic clinical courses and can lead to cirrhosis and other serious physical and mental complications. The aim of treatment is to use all available therapeutic options to prevent or postpone the need for liver transplantation. 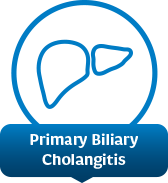 Primary Biliary Cholangitis (PBC) is a chronic disease of the liver that starts in the bile ducts within the liver. As these ducts are destroyed by inflammatory processes, bile accumulates in the liver (cholestasis). Ultimately the active liver tissue is destroyed and replaced by fibrous tissue. This is the basis for the development of cirrhosis of the liver. PBC most frequently affects women over the age of 35 to 40 years. At first, the disease may progress without specific symptoms, although patients may notice increased fatigue, occasional itching (pruritus) or dry mouths. Not infrequently, the disease is discovered by coincidence when elevated liver enzyme levels are noticed as part of a routine examination. As the disease progresses, patients with PBC may develop jaundice and yellowish-gray fat deposits in the skin of their eyelids (xanthelasmas) and some patients may report pain in the joints. PBC can be recognized based on a few simple laboratory tests. Increased levels of certain liver enzymes may indicate bile accumulation, however the transaminases are only slightly elevated. If, in addition, patients show increased levels of the immunoglobulin IgM and antimitochondrial antibodies (AMA) are detected in the blood, the diagnosis can be confirmed. Ursodeoxycholic acid (UDCA) is the drug that has been proven to have beneficial effects not only on symptoms of PBC but also on laboratory parameters (blood test) and life expectancy. The UDCA therapy should start immediately after the diagnosis has been confirmed and should be continued indefinitely. This at least slows down the progress of the disease and in favorable cases the liver transplantation may be postponed or even avoided. Using the correct dose of UDCA and adherence to therapy are crucial in treatment of PBC. Dosing is calculated on individual basis and is dependent on patient body weight which should be monitored regularly in order to maintain the correct dose. 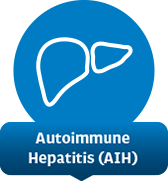 Autoimmune Hepatitis (AIH) is a chronic inflammation of the liver. The exact reason for the inflammation is still unknown. The disease often has an insidious course with rather non-specific symptoms such as fatigue or sicca syndrome (extremely dry skin, eyes and mouth). However, in some patients the onset of symptoms can be sudden and can take a severe course with acute hepatitis. AIH is a rare disease and for unknown reasons it affects women more frequently than men, approx. 70% of patients are female. It can occur at any age but it is usually not diagnosed before patients are 40. At first, the disease may progress without specific symptoms, although patients may notice increased fatigue, weight loss without dieting, nausea, upper abdominal discomfort and blood tests show normal liver function tests. There are approx. 10,000 AIH patients in the UK. AIH can be challenging to diagnose as there is no single diagnostic test to confirm the disease. It is necessary to exclude other liver disease like viral hepatitis, Wilson’s disease, alcohol or drug induced liver disease, and there are blood tests which can help establish this – elevated liver function parameters (IgG) and specialist autoimmune antibodies (ANA, SMA, LKM) are usually used. About 1/3 of the patients present with liver cirrhosis. Histological test can confirm AIH with certainty but as it involves taking liver biopsies (invasive method of taking a small sample of liver tissue) it is not usually used. Steroids (usually prednisolone or budesonide) have been proven to induce remission in AIH patients by treating the active inflammation. Immunosuppressants (azathioprine) are usually added to the steroid therapy after 4 weeks. For maintenance of remission it is recommended to continue with immunosuppressant therapy alone and add in steroids if required. The therapy should be started immediately after diagnosis. For patients who are non-cirrhotic and cannot tolerate steroid side effects budesonide can be prescribed as it offers similar efficacy to prednisolone with a significantly reduced risk of side effects. It is important to discuss available treatment options with your doctor t as the therapy is commonly lifelong. Relapse is very frequent and it is crucial to adhere to the prescribed therapy to reduce the risk of frequent relapse. 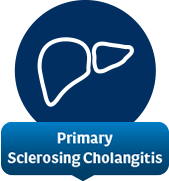 Primary Sclerosing Cholangitis (PSC) is a chronic liver disease that predominantly affects men aged 25 to 40 years. It is characterised by inflammation of the bile ducts that leads to narrowing (stenosis) with accumulation of the bile in the liver (cholestasis). The bile, which also contains aggressive bile acids, causes damage to the liver cells, ultimately leading to destruction of liver tissue. Patients progress to cirrhosis of the liver. The disease often slowly progresses for years without specific symptoms and is often discovered by coincidence in a patient with abnormal liver enzyme levels. In a more advanced stage, patients complain of jaundice, fatigue, itching (pruritus) and, in some cases, nausea. In 80-90% of cases, PSC is accompanied by a chronic inflammatory bowel disease, such as ulcerative colitis (80-85% of cases). Patients often report significant relief in symptoms when they are treated with ursodeoxycholic acid (UDCA), which is one of the body’s own bile acids. UDCA promotes the bile flow. This is, however, only a symptomatic therapy. The disease is not cured by this treatment. The most favourable treatment results are achieved when patients with PSC undergo endoscopic dilation of stenosis in the bile ducts. This permits the bile to flow more freely. Patients also receive continued treatment with UDCA. This treatment significantly slows further progression of the disease, the need for liver transplant is reduced and only becomes necessary after a longer disease duration. UDCA is not licensed in the UK and Ireland for this form of treatment.